Miracle Beads - what are miracle beads? 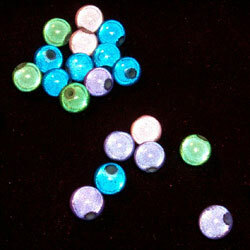 Miracle beads, also known as Magic Beads, are super-intriguing because they seem to glow in natural light. They also have the optical illusion of having a bead within a bead. Hence the names for these beads. These magic beads are a form of plastic beads. They are normally very bright and made from some form of fiberglass material. The bead is sprayed repeatedly with a reflective material and finished with an outer clear coating. It is these layers that create the tantalizing illusion of a bead within a bead. It is also what makes the beads seem to glow in natural light. Thanks to a query by our visitor Lois Bush as to whether Magic Beads are harmful to wear because it contains fiberglass, the answer if no. No more than plastic beads or glass beads. The question is a very good one because the very mention of "fiberglass" now produces a shudder of fear. The fiberglass used in the beads are of the kind known as glass-reinforced plastic (GRP) which is pretty much inert. And in the case of Magic Beads used in the jewelry making industry, the beads are encapsulated with layers and layers of protective reflective coatings and clear outer coatings. This is what also gives them the magical, luminous illusion of double glowing beads. Glass fiber (or spelt as glass fibre) however is the one that has raised the health awareness towards that substance around the world. This unfortunately has now become commonly know as "fiberglass" (a generic trademark), which is really glass wool and was is/was used as insulation material. Due to the identical terming and the overlap of use of glass in some form, the fiberglass in the Magic beads and the fiberglass in insulation often causes some unnecessary but justifiable concerns. The material use to produce Magic beads can in fact, be correctly viewed as some form of plastic. Originally these beads came from Japan but these days, they are produced in many countries. However it is not unusual that they are still often called "Japanese Miracle Beads"
Magic beads are not expensive. They come in a huge assortment of colors (singular and multi) and in many sizes.